I have the first album that The Cry released and I liked it. I wasn't floored by it or anything, but it was a solid poppy record that got played in my rotation reasonably often when it came out. As what happens to all but the very best of records, it got filed away and hasn't been on my turntable in a while. When I saw the band had a new record out, I absolutely wanted to pick it up, expecting another good outing from them. I was completely unprepared for the truly dramatic increase in quality in Dangerous Game compared to their debut. Where that record was pretty good, Dangerous Game is just stellar. Though I think the first band that might come to mind while listening to Dangerous Game is the Cute Lepers, I'm actually kind of shocked that The Cry isn't from Canada. I think you could definitely have this filed next to your Mother's Children or Sonic Avenues records and feel pretty good about that classification. I think The Cry is slightly more glammy, slightly more pop and maybe a bit less garage than either of those bands, but Dangerous Game is every bit as amazing. The band really excels in delivering fast past, guitar driven tunes with fantastic backing vocals and harmonies. The absolute standout of the record for me is "Toys In The Attic." All of the ingredients of the perfect guitar pop song are present and it's likely one of the best songs I've heard in 2014 so far. I can't recommend this record highly enough. Even though there's a kind of goofy picture of the band on the back cover, I'll let them slide because the music is just so damn good. 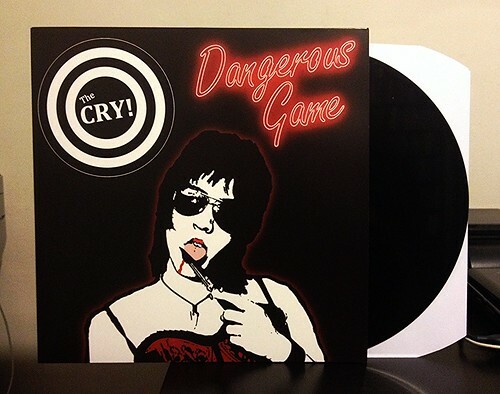 DANGEROUS GAME LP by THE CRY! V/A - Puke & Destroy III 7"
Chestnut Road / BUZZorHOWL - Split 7"